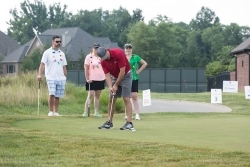 Successful 2018 IndyCREW golf outing results in sizable donations to charitable organizations. Indianapolis, IN, September 07, 2018 --(PR.com)-- Yes, the rumors are true! IndyCREW hosted another one of their themed filled annual golf outings, this year celebrating Christmas in July. The holiday spirit must have been in full effect as the organization was able to make meaningful donations to Dress for Success Indianapolis, Prevail, and The CREW Network Foundation. You can’t have a friendly competition without a winner, which went to Chris Hagenow’s foursome. The team received (4) foursomes to play again at Sagamore. And you can’t have a themed function without prizes. Again, IndyCREW can’t disappoint when awarding the best dressed theme-individual, sponsor and foursome. IndyCREW dominated the course this sunny day with a headcount of 37 foursomes, not including those attending in spirit. Check out all the fun they had by typing in their hashtag #JingleInJuly on Twitter and Instagram. Don’t miss out on the fun next year and #ChooseIndyCREW. IndyCREW, established locally in 2001, is a chapter of CREW Network which has more than 10,000 well-educated and experienced professionals, including nearly 200 members locally. Membership provides instant connection with online access to these 10,000 professionals, globally. CREW members represent nearly every aspect of the commercial real estate industry, including development, brokerage, property management, law, finance, architecture, interior design, title/escrow, asset management, engineering and every other expert required to make a deal happen. And deals do happen. One recent survey of members indicated that more than 75% of members have received or given a referral to or from another member.